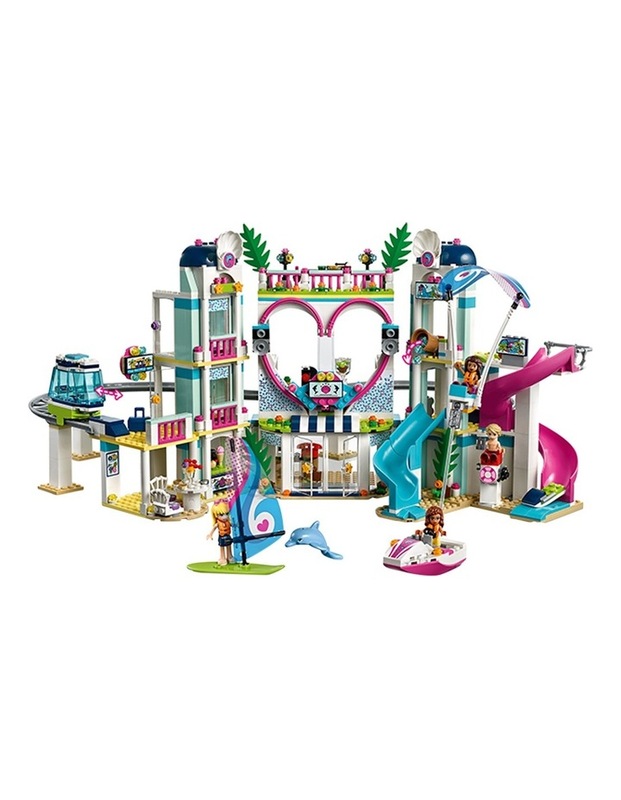 The LEGO Friends 41347 Heartlake City Resort is the place to hang out and have fun in Heartlake City! The hotel has a lobby, restaurant, juice bar, terrace with a DJ stand and 2 bedrooms. Drive the monorail round to the water park with changing room, 2 waterslides and a splash bucket, plus a beach area with a water scooter, parasailer and a lifeguard stand. 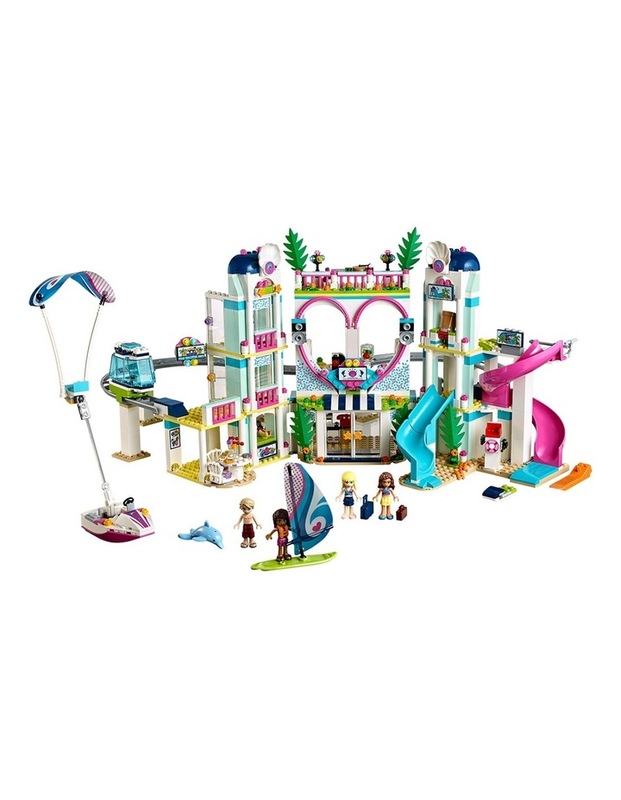 This amazing LEGO Friends set includes 4 mini-doll figures plus a dolphin figure. - Includes Stephanie, Andrea, Olivia and Mason mini-doll figures, plus a Sheen the dolphin figure. - Features a resort hotel with moving monorail to a beach water park. - Hotel features lobby with telephone and computer, juice bar with blender, roof terrace with DJ decks, restaurant and 2 hotel rooms. - Water park features 2 slides, tipping splash bucket, water scooter with detachable parasailer, windsurf board, lifeguard stand and changing rooms. - Accessory elements include luggage, key, hot dog, ice cream, fruit, cups, bowl and a walkie-talkie. - Head to the lobby to collect the key for your hotel room, then grab a drink from the juice bar. - Take the monorail to the beach water park to try out the slides and enjoy some watersportslook out for the friendly dolphin! 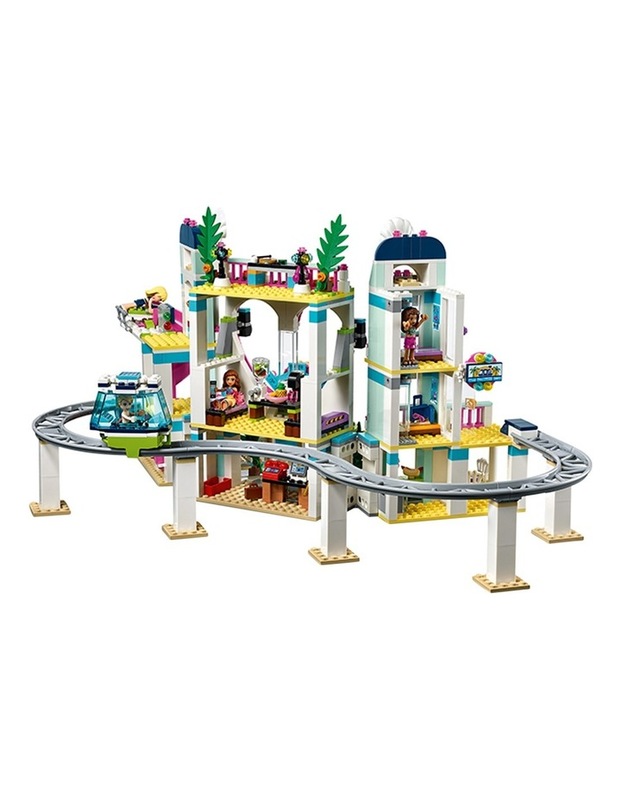 - Dance the evening away at the hotel rooftop party with friends with this big LEGO Friends set. - Heartlake City Resort measures over 10 (26cm) high, 20 (51cm) wide and 11 (29cm) deep. - Monorail car measures over 2 (7cm) high, 2 (6cm) long and 1 (3cm) wide.